Infertility is a notable global public health concern, and it reflects in the findings by the World Health Organization that 10% of women are inflicted; the overall impact of subfertility or infertility is significant both in men and women, and hasn’t decreased in the span of last 20 years or so. Moreover, issues pertaining to sexual health is growing owing to the excessive usage of birth control measures in pills and medicines that imbues infertility. This is leading to an observable growth prospects in the in vitro fertilization market, which was valued to be $7.1 billion to $8.5 billion as of 2018. Furthermore, the demand in the global IVF market will grow with a remarkable CAGR of 8.5% to 9.2% during the forecast period of 2019 to 2025. In Europe, the average birth per woman has fallen down significantly over the years. While there are other factors like changes in religious faith, affordability of child, and equal rights for women to live an independent life; it’s infertility that is attributed as the major factor for the discernible decline in the childbirth. The prevalence of infertility is more in countries such as Denmark and Spain. This has been opening up the in IVF market in Europe that held the maximum share 38% to 40% in 2018, according to the findings by the market analyst. In vitro fertilisation is a type of assisted reproductive technology used as infertility treatment and gestational surrogacy that involves zygote which undergoes embryo culture. The process is executed through three different methods that involve instruments, consumables, and accessories & disposables. However, the most preferred mode of IVF is through consumables, and the implementation of IVF through consumables will grow with a CAGR of 6.1% to 6.3% through to 2025. According to the World Health Organization (WHO), 2.8 million people die each year because of obesity and obesity is linked with a gamut of health-related problems that also include infertility. It is attributable to low sperm counts in males and menstruation dysfunction that leads to anovulation and infertility. Apparently, the number of obese people is perpetually on the rise which is widening the IVF market size. There is a lot of environmental factors that are associated with infertility. These include air pollution, household water insecurity, disease vectors, and chemical hazards. Furthermore, stress has been observed as one of the most recurring factors responsible for anovulation. Now, the millennial lifestyle is inundated with stress, improper hygiene, and lack of sanitation, and these factors are collectively responsible for infertility. In addition to that, due to the growing industrialization, a significant part of the world population is working amid hazardous chemicals, and the remaining population is either living near industries or is passively affected by the circumstances. This leads to a greater susceptibility of individuals towards infertility. 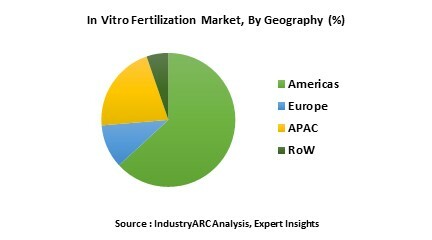 “Considering that the lifestyle of the millennial generation is a threat to the reproductive health, and the environmental factors are having a profound impact on the same, the in vitro fertilization will observe an upsurge in demand in the coming years,” adds the market expert in the in vitro fertilization market research report. In many societies, childbirth is still considered as an integral duty of women. Even though there is a positive penetration of women empowerment across the globe which is aiding to the individuality of women; but unfortunately, the inability to reproduce is still a societal dogma in some parts of APAC, Africa, and other small countries across the globe. This is a major reason many couples seek for in vitro fertilization or surrogacy in order to gain acceptance in the society which further strokes the IVF market. In November 2018, National Registry of Activity of the Spanish Fertility Society (SEF) revealed that in 2016, 138,553 IVF cycles and 34,463 artificial inseminations were executed in Spain. Latest Development – In April 2018, ObsEva – a company that develops reproductive treatment methods had reported trial results of a therapy that can increase the success rate of in vitro fertilization. This innovation will hugely impact the IVF market by instilling further surety factor and subsequently garnering a larger customer base. The major challenge in front of the vendors in the IVF market is the regulations pertaining to the process which entails some requirements in the laboratory that shoot up the investment. Additionally, in the contemporary world, IVF has been perceived as an exploitation of women which is again dwarfing the IVF market size. However, factors associated with infertility coupled with the fact that surrogacy has become rampant is creating a sustainable marketplace for the IVF industry. The key players in the IVF market are OvaScience, EMD Serono Inc., Vitrolife AB, Irvine Scientific, Cook Medical Inc., Cooper Surgical Inc., Genea Biomedx, Thermo Fisher Scientific Inc., Progyny, Inc., and Boston IVF. The base year of the study is 2018, with forecast done up to 2025. The study presents a thorough analysis of the competitive landscape, taking into account the market shares of the leading companies. It also provides information on unit shipments. These provide the key market participants with the necessary business intelligence and help them understand the future of the IVF market. The assessment includes the forecast, an overview of the competitive structure, the market shares of the competitors, as well as the market trends, market demands, market drivers, market challenges, and product analysis. The market drivers and restraints have been assessed to fathom their impact over the forecast period. This report further identifies the key opportunities for growth while also detailing the key challenges and possible threats. The key areas of focus include the types of IVFs, and their applications through incubators and micro manipulators. The report analyses the product demands by the method that include natural IVF, co-incubation, and egg retrieval. Its application is also segmented into application areas such as clinics and research institutes. Is the market demand for IVF growing? How long will it continue to grow and at what rate? Which type of home security system presents the major growth opportunities? Is there a possibility for change in the market structure over time? Are additional developments needed for the existing product or services offerings or do the existing products meet the customer demands? Do the key vendors look for partnerships to expand their businesses with respect to geography or product? What are the short-term, long-term, and medium-term growth drivers for the market? What are the short-term, medium-term, and long-term challenges for the market? Who are the top players/companies of the market? What are the recent innovations in the market? How many patents have been filed by the leading players? What are the types of patents filed by the leading players? What is our Vision 2030 for IVF market? 13.2. K-Systems / Kivex Biotec Ltd.